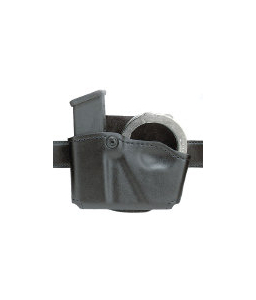 Safarliand Leather Magazine Hoder & Handcuff Pouch | 700304, SAFARILAND, Safarliand Leather Magazine Hoder & Handcuff Pouch | McDonald Uniforms, Inc. The low cut design of this Safariland holder provides quick access, while the paddle makes it quick and easy to put on and take off. A suede lining holds the magazine and cuffs snug and quiet. Features an adjustable tensioning device which allows you to customize the feel of your draw.